While growing up a Protestant, Terry Modica developed a relationship with Jesus. As a teenager she strayed from the faith due to an interest in the occult. Eventually, she was touched by the Holy Spirit who led her to the Catholic Church. After several years of struggling to understand what role Mary and the saints should have in her life, she experienced a miraculous overnight devotion to the Blessed Mother. Soon after, she began to read about the saints. Through studying their lives, these residents of Heaven have become in a way, her spiritual directors and close friends. 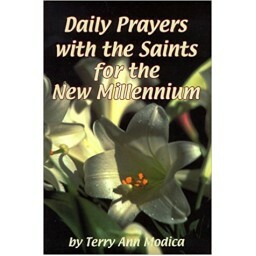 This book will help the reader experience the friendship and spiritual guidance of hundreds of saints, one for each day of the year and prayers to point them in the right direction.